The notebook of the Revd Herbert Randolph, curate to the Revd James Mapleton, vicar of Mitcham, is an excellent example of those minor gems, the discovery of which is so encouraging to the local researcher. Like the flickering of a match which momentarily illuminates the details of a darkened room, it provides both a glimpse of the living conditions of the poorer parishioners of Mitcham in the years 1837/8 and also an interesting account of the work and responsibilities of the curate himself. The book is now in the possession of Merton Library & Heritage Service. The entries fall into two sections. 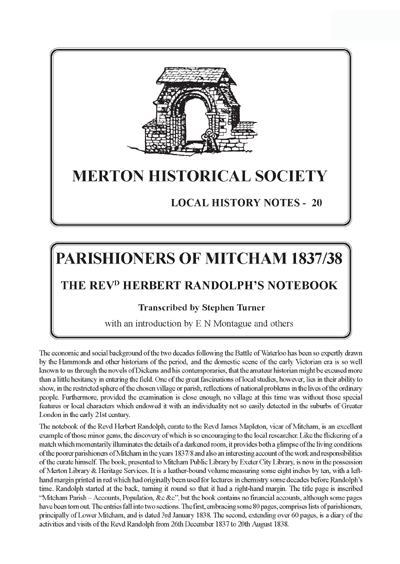 The first, embracing some 80 pages, comprises lists of parishioners, principally of Lower Mitcham, and is dated 3rd January 1838. The second, extending over 60 pages, is a diary of the activities and visits of the Revd Randolph from 26th December 1837 to 20th August 1838. Extracts from the 1846 Tithe Apportionment map have been included in this publication and plot numbers have been added to Randolph’s lists of parishioners wherever the name of the occupier matches that recorded by him, even though the spelling of the name may not be identical. Randolph was keeping this notebook for his own use, and had no expectation that others would be reading it some 160 years later. His handwriting is typical of personal jottings, and his spelling of personal names is phonetic and is not always consistent. An alphabetical index of surnames appearing in the notebook has been provided, and researchers should look at the alternative spellings. London in the early 21st century. A modern map of Mitcham locating the districts shown on the large scale maps. activities and visits of the Revd Randolph from 26th December 1837 to 20th August 1838. Map reproduced by permission of Merton Design Unit, London Borough of Merton. diplomat and politician, and has his own entry in the Dictionary of National Biography. ‘incorporated’ from Oxford in 1843.
become vicar of Coundon, now part of Coventry. He died in 1859. Riverside Drive). All traces of the cottage are long gone. then took her to Cambridge and later to Baldock – presumably to see her family and give them the news. day that his 26-year-old wife died, of ‘child bed fever’. was performed by one of Herbert’s brothers, the Revd William Randolph, curate of Newington, near Folkestone. been quite unusual for peers to have chaplains as part of their households, and it was probably not an arduous post. Probably because of his literary enterprises Herbert Randolph appears in Boase’s Modern English Biography. Randolph died on 16th September 1887, at Bray, south of Dublin, where he is buried. afford to pay for one, has a Bible, given her by R.C.” [Presumably the Revd Richard Cranmer, the former vicar]. of Mitcham Canons, lived in a house on the site of the present entrance to Birches Close(plot 881 on the Tithe map).
. Mrs Emily Simpson, sister and heir to Richard Cranmer, and wife of William Simpson, lived at The Canons (870). East (716) or of his neighbour George Goad (651). Court flats in London Road (1273).
. The Misses Anna and Maria Baughan occupied a house in Commonside West overlooking Three Kings Pond (846). Carlisle, who Randolph noted had also been a subscriber to the Missionary Society for some years. Allen’s wages are not recorded, it is unlikely that they were high, since the industry was in a depressed state at this time). and of Henry and Charlotte Thompson, Randolph recorded “26 weeks out of work. Son nearly 21 no work for last 8 months. Badly off”. From Randolph’s notes, which obviously do not include all the parishioners, it is not possible to draw any reliable statistics as to poverty, unemployment, and so on. aged, infirm or mentally deranged being admitted to the workhouse. “William Upham, widower … son is married and … works at Mr. Walmesleys, receives 10/- or 12/- per week …” “Gosling, … works for Mr. Simpson at 15/- per week”. “very unsteady” and was “not well spoken of”. 22 Sunday. Alone. One Baptism. 2 full Services. 23 Drove Martha to Beulah Spa. * Visited poor. Drove to Sutton. Called at Mrs. WELLS’s. Christened Mr. BARTHOLOMEW’s Child. BENNETT – gave notice about Houses in Half Acre row. 27 Drove Martha to Streatham. Mrs. CAYLEY. August 8 ) Called on Parishioners. Visited poor &c. daily – too much occupied to write particulars. 8 Went to London. Sold Stock at Bank – paid Bills &c &c.
9 to 12 Visited Poor &c &c.
13 Attended 3 Committees at N. School. Body of a man found in the parish this mg. – suspicious circumstances. Epilepsy – my impression that it was not so. 15 Visited poor &c &c – buried man found dead. 16 Do. – Miss MAPLETON James & David with Wm. SIMPSON dined with us. 17 Mr. C. GIBBES with his Son & Daughter spent the day with us. 18 Rumour of murder of man whose body was found on 13th, revived. At N. School from 9 to 11. 19 Sunday. Two full Services – alone – Wife of man found Dead at Church in Evening – his name James BUDD. 20 Drove to Kingston on Thames to see Coroner. Wm. SIMPSON dined with us. book had been used for “Lectures in Chemistry”, though a Latin quotation occupies a page between the two sections. Lawns open space off Beulah Hill. ** Mrs Henry Ashby, wife of Henry Pollard Ashby of Wandlebank House, in what is now Wandle Park. and girls were in service, took in washing, or went to the large houses as ‘daily women’ to do the laundry or cleaning. the Napoleonic Wars. He died while serving with Wellington’s army in the Iberian Peninsula. pm and on another from 9 am to 3 pm. “Glaize and Wife do not live together. She has her ducks and chickens in one room, and he whatever he likes in another. the placement of the daughter, the father was received into the workhouse. * The word ‘can’ is crossed out. Randolph’s Mitcham diary has no introduction or postscript – no explanation for its beginning or for its abrupt end. towards the end, especially after his mother’s death on 19th June 1838. Gazette, had nothing to say on the matter. The death of James Budd therefore remains a mystery. “Merret – old …C.side – sinking. Died in evening”, “Williams … Aspreys, better” and “Whitfield … Baron Row – ill”. “28 Sunday Service at Workhouse –Two full services at Church –alone. One funeral – Baley’s Child –two Baptisms. Mg Do. 2 Baptisms. called up in Night to Boys. with her from 2 o’clock till 5½”. (Mrs Boys’ daughter, who lived with her mother in Church Street, was visited daily by Randolph until she was better). May 5 “fished at Yorke’s & Rutter’s mills” with Arthur Pryor. downstream from Mill Green, and Rutter’s snuff mill was at Ravensbury. J Mapleton was presumably the vicar’s son). far from neglectful of the less fortunate members of his parish. Church at this time, that Randolph’s notebook derives its great interest for the parish historian. 14 Drove to London. Met Martha & returned to Mitcham with her. Funeral of Mrs. CHESTERMAN’s Mother at 6 P.M.
Church – heard Children sing. BARR, GITTIN Lodger died this mng. Do. Funeral of Child who died of Small Pox at 9 P.M. Called at PARR’s house in Evg. 16 At N. School from 9 to 11. 17 Sunday. Mg. Service alone. Called away to Cambridge by Letter from Jane RANDOLPH – wh. arrived at 1 O’Clock. Went to Cambridge by Mail. 29 To London. Dined at GIBBES’s. 7 N. School from 9 to 11. Called on sick. 8 Sunday. DARNELL assisted at Communion, alone rest of Services. 9.10.11.12 Visited poor &c. &c. Went to London on business. 13 Baptised DANIELL’s Child. Churched Mrs. DARNELL. Visited poor. 14 At N. School from 9 to 11. Visited poor. 15 Sunday. Mr. MAPLETON here. Archdeacon HOARE preached for Infant School. 16 Committees from 9 to 2. Visited poor. 18 Went to Town on business. 19 Dined at Mrs. BECKFORD’s. Visited poor. 21 N. School from 9 to 11. Visited poor. * .a.a…. – The Greek word means ‘blessed’ as in Revelation 14:13 – “Blessed are the dead which die in the Lord”. Called on Mr. Boyd MILLER. National School & Infants Do. 17 Breakfasted at Mr. FINDEN’s. Visited Infant School, St George’s Hanr. Square. National Schools, Westminster. Called upon Mrs RENDALL with Martha. 9 Took Martha to Royston on way to Baldock. 11 Returned to Mitcham. Attended meeting of Organ Committee at 7 P.M.
12 Called on SIMPSONs & afterwards dined there. 13 Called on Lady LUBBOCK & Mr. WALMESLEY & Mr. SIMPSON. History Notes 21 and 22). word, an image of the original has been reproduced at the end of the entry. marriages and deaths, which began in 1837 and are now available at the Family Records Centre. and published by Bloomsbury Publishing Ltd (1987). The Society has tried, without success, to trace the copyright holder. Cottage in the yard of old Farm House. injure her faculties. 1 young child who had fits for 2 hours a few weeks since the 1st time. [?] ? 9 Wm. & Ann FERRAGE 1 child. Labourer very badly off. Wm can’t read ? indifferent health, subscribing for a bible. ? wife’s mother BARLEY lives with them, she is a pensioner of Mitcham 2/- a week & mother to Mrs.
* Randolph restarts this list on the next page, with more details about the families listed. The thicker grey lines indicate a new page. 6089/1/47). The numbers are not used in the original notebook. 2 Fished with J. MAPLETON. Called at Yorke’s. Met ROLAND lodging at BARR’s – intoxicated. Mem. inquire. Miss MAPLETON and her Brother left us to-day. Mrs. SLATER died this day. 3 Rode to London to Dr. CHALMERS’s Lecture, Hanover Square Rooms. MERRETT & WELLER Widow Do. Funeral of HUSSEY – died suddenly. 5 School from 9 to 11. Administered the H. Sacrament to Mrs. RENDALL. Mrs. PHILLIPS attended, of A. Houses. Arthur PRYOR came – fished at YORKE’s & RUTTER’s Mills. 6 Sunday. 2 full Services. 1 funeral. 3 Baptisms, alone. 7 Went to London with Martha & Isaline, thence to Baldock. Alfred PRYOR married to Jane PRYOR. 12 To Mitcham. Dined at Mr. MAPLETON’s, alone. 13 Sunday. Divided Services with Mr. MAPLETON. 2 Baptisms. 14 Committees from 8½ to 12½. Went to London brought home Martha. 15 Rode to Streatham, called upon Mr. BLUNT, Mr. SIMPSON, Mr. GLYNNE, Mr. BURN. Sunday. Service at 11 – at School from 2½ to 3, funeral (JOHNSTON) at 3. Service at 3½. 2 Baptisms. Alone. 23 SHEPHERD old C. Lane died at 9 P.M.
Cyril RANDOLPH called this mng. Called upon Mr. COLLINS. Factory. James & Miss MAPLETON came to us to-day. Fished with J. MAPLETON & R.V. P.
National School from 9 to 11. Walked with Martha, Miss MAPLETON & J. MAPLETON to Phipps Bridge etc. Copyright of Surrey History Service. Reproduced by permission. 29 Sunday. Service at 11 & 3½, three funerals – SHEPHERD, MOULD & MARTIN, two Baptisms. Alone. 30 Fished with J. MAPLETON. Dined at G. HOARE’s. 1 Fished with J. MAPLETON at Yorke’s Mill & caught 3 lb, 2½ lb, 1½ lb Trout. 21 No.5 Charles HUGHES, woman takes in washing for which she charges very reasonably & deserves encouragement. Cottages from MORRICE’s Corner to Mr. GLYN’s. 15 years of age. No want of Books. * Samuel Makepeace occupied a calico-printing factory in Willow Lane, plot 1399 on the 1838 Survey of Mitcham. ** George Carr Glyn occupied the house usually known as The Cranmers, plot 1386 on the 1838 Survey. 14 Service at 11 A.M.
At N School from 9 to 11. M.P.S.A. &c. &c.
JOHNSTON Do. died this mng. 3½ P.M. alone. Mr. MAPLETON absent. Easter Sunday. One Funeral – DANIELLS – three Baptisms. Dined at Mrs. CAYLEY’s, took Arthur & Isaline PRYOR. 17 Service at 11. Vestry from 12 to 2. Mr. Mrs. & David MAPLETON dined with us. 18 Administered Sacrament to Mrs. BROWN. Attended Mrs. THORNTON & Mrs. MERSH. Mr. & Mrs. WILSON, Revd. GOODDAY, Revd. DARNELL dined with us. 21 School House from 9 to 11. Committee of Female Friendly Society from 1 to 2½ P.M.
DANIELLS C. Way died this mng. SOMERS & HONE about SOUTH Do. 8 Sunday. Service at 11. Sacrament. Mr. MAPLETON prevented coming down by illness of Mr. TURNER’s sister. Revd. GOODDAY assisted at Sacrament. Service at 3½ P.M. 3 Baptisms. 9 Committee from 9½ to 10½ A.M. Called on Mr. FINDEN on business of Schools. Service at Church at 11 A.M. Drove Tommy PRYOR to Kennington T. Pike. Called with Martha & Isaline PRYOR, on Mrs. WILSON & Mrs. BECKFORD. Called with Martha & I. PRYOR on Mrs. BECKFORD, Mr. TRITTON & Mrs. WALMESLEY. Called on Mr RODBER, Tooting, about Tutor for Mr. BARWELL -called to communicate result to Mrs.
13 Good Friday. Service at 11 A.M. & 3 P.M. Houses from HAYDON the Butcher. Widow O – is partly deranged. Rand gives her room rent free to live in. Seven blank double-sided pages follow. The “Houses from Haydon the Butcher” were in Western Road, overlooking the Upper Green. Other places mentioned in the diary section have also been identified on the map. Jany 4th 1838 Miss GOAD’s District. 7 Mrs ALLEN not a subscriber 612? Thos. BINGHAM & wife, have an aged Father to support, can’t afford to subsbe, have Bible & Prayer Book. The back of this page is blank. The next page has been cut out, but the left hand edge remains, with a list numbered 1–22. but no entries have been made. A further five blank sides follow. Drove Mrs. RANDOLPH to Wallington & Sutton, called at Mrs. WEBB’s & Colonel WELLS’s. Called on Mr. SIMPSON about PALMER. 30 Service at Church 11 A.M. Catechised Children. Rode to Wallington, Mr KING’s sale. Dined at Mr. MAPLETON’s. Mr. DREE present. 31 N. School from 9 to 11 A.M.
Sydney TURNER dined with us. in Mng. with Mrs. RANDOLPH. Dined at Mr. MAPLETON’s. 2 Drove to Cadogan Place, thence to Mr. R. PRYOR’s. 3 Drove to Ewell from London, to meeting of S.P.C.K. District. * Mr. BETTERLEY from Canada present. 4 Drove Mrs. R. to Mitcham, arrived 10¼ A.M. Service at 11. Mrs. PRYOR, Elizabeth GOULD, Jane PRYOR & Isaline spent day at Mitcham. Service at Church at 11. Catechised Children. Miss Goad’s District included shops and houses from Upper Green to Three Kings Pond. Three Kings Pond c.1910, showing Chart’s and neighbouring shops. Sunday. Service at W. House. at Church Mng. & Afternoon. One Baptism – Catechised Children at National School. Called on Mrs. SIMPSON about BOTTON. Service at Church at 11. Called at Mr. SIMPSON’s – about Schools. Ill of Influenza at home. Rev. Mr GOODDAY took Mng. Prayers at Church. I preached etc. & performed whole of Evg. Service. Sunday. Drove Mrs. R. to Epsom Race Course & home by Ewell. 11 Sunday. Service at W. House. 2 Services at Church. Sacrament. 2 Funerals. 2 Baptisms. Mr. MAPLETON present. 12 School from 9 to 1½ on Committee of National, Sunday & Infant Schools. Called with Messrs. MAPLETON & SIMPSON at Major MOORE’s. 13 Called with Mr. MAPLETON at Mr. DARNELL’s. Settled abt. Workhouse Duty. A page from the first section of the Notebook (transcribed opposite). Reproduced by permission of Merton Library and Heritage Services. 14 Service at Church at 11. Called with Mrs. R. at Mr. GOODDAY’s. 15 Drove Mrs. RANDOLPH to Tooting. Workhouse. Visited STAMMERS. Catechised Children. Called on Mrs. RANDALL. In morning called with Mr. SIMPSON on Mr. FINDEN – inspected two sites for Infant School. Ascertained Mr.
Service in Church at 11. Catechised Children of N. School. Called upon Lady LUBBOCK with Mrs. RANDOLPH. 17 N. School from 9 to 11, business as usual. Called upon Mr. DARNELL about Workhouse, upon Mr. SIMPSON about COWELL. Sunday. Service W.House ¼9. Church 11 A.M. & 3 P.M. 4 Christenings, alone. Called with Martha at Mr. SIMPSON’s & Mrs. BECKFORD’s. Service at Church 11 A.M.
9 Service at Church 11 A.M. Catechised Children. School from 9 to 11.
daughtr is now there also. Widow CHESTERMAN very kind to the children who are left a great deal to themselves. the Buck’s Head, has a bad leg, their house appears very dirty & comfortless. 1358? HOARE’s family – he is obliged to keep a boy from school to go about with him. 3 little girls go to the Infant School. GLAIZE and wife, do not live together. She has her ducks & chickens in one room, & he whatever he likes in another. lodges there pays 2s/- per week, all her children are grown up but 2 girls, the youngest goes to the National School. is employed by Mr. Makepeice. PLANK Wm. & wife. 3 children, he gathers ashes. Eldest a daughter lives with a Gentmn & his sister, near London. House at the end of the alley unoccupied. previous to the removal of the daughter, the father was received in the Workhouse. binding. A further three blank double-sided pages follow. Called at Mr. BECKFORD’s. Very ill.
24 N. School from 9 to 12½, attending to Coal Fund etc. Mr. BECKFORD died this morning. Administered the Holy Sacrament in evening to Daughter of Mrs. BOYS in Church Lane. Very ill. Communicated with her, Mrs. BOYS. Mg Do. 2 Baptisms. Called up in Night to BOYS, with her from 2 O’clock till 5½. 26 BOYS C. Lane better in evg. 28 Ash Wednesday. Service at Church at 11. Called at Mrs. BECKFORD’s. Called at Mrs. Boyd MILLER’s. Visited JOHNSON nr. Merton Gate. W.House – Mrs. STAMMERS, K. GRIFFITHS & others. 3 School from 9 to 11 A.M.
Work House. Visited GRIFFITHS ill & STAMMERS, very ill, gave book. ROBERTSON better. Visited School. Called upon Mr. SIMPSON & Mr. BECKFORD. WILLIAMS husband ill Asprey’s Yd. 3 N. School from 9 to 3 giving Tickets for Coals etc. 4 Sunday. Workhouse ¼ 9. Wedding 10. Service 11. 2 Funerals 2½. three Christenings. Service 3. R.V. PRYOR took duty at Mitcham. Mr. MAPLETON present. 12 at Baldock. Shot with A. PRYOR. Killed 2 wild swans. 15 Do. Shot with A. & R.V. PRYOR blank. 16 Called with Martha at Mrs. PEACOCK’s, Miss PRYOR’s, Mr. SMITH’s, Mr John PRYOR’s. to Merton Turnpike. Visited JOHNSON – sick – & Mrs. SEWELL, aged. No assistance. Sacrament to JOHNSON & his Wife, & old Mrs. SEWELL. Infant School. Went to Town at 4 P.M.
20 Got to Mitcham at ¼12. National School. Called at Mr. BECKFORD’s – went to Town Evg. 21 Came down with Mrs. R. at ¼ 12, had cough did not go out. * George Matthew Hoare, 3rd son of Henry Hoare of Hoare’s Bank, lived at The Lodge, off Central Road, Morden. Mrs Cranmer’s District included her neighbours around the Cricket Green. Mrs Simpson’s District also extended into this area (plots 1363-67). Coal yard. Behind the Public House. Gave Prayer book to RICHARDSON at Workhouse. Association for reduction of prices of Bibles & Prayer Books from 6 P.M. to 7 P.M.
28 Sunday Service at Workhouse. Two full Services at Church – alone. One funeral. BALEY’s Child – two Baptisms. Went to London, on Horseback. HARTFIELD & CREWE Do. Do. 20 School from 9 AM to 3 PM gving away Tickets for Coals, Blankets etc. 21 Workhouse Service. two duties in Church two funerals. No assistance. 22 Frost broke up having continued from the 8th with great severity. The Revd Robert Tritton was Rector of Morden and lived at Steelehawes in Central Road, Morden. Mrs Hilliard’s District covered Lower Mitcham. from Henry Hoare’s executors in 1828. Born in 1773, he died in 1840. DUFF young couple. 4 children Do. HASLAM 2 children ill H. A. R.
HARRIS 2 children ill Do. Thirteen blank double-sided pages follow. A page from the second section of the Notebook – January 1838. The Misses Baughan’s District extended from Upper Green to Locks Lane. WILLIAMS Mrs, Asprey’s Yd. Do. ANDREWS, 5 persons Do. Do. CORNISH, widow C. Side Do. 28 W B Esq. Cidd HS ? ** H cough – whooping cough? This entry was posted in Publications, Local History Notes, Publications and tagged in lhn, lhn20, mitcham, parish records, tithe, victorian mitcham.